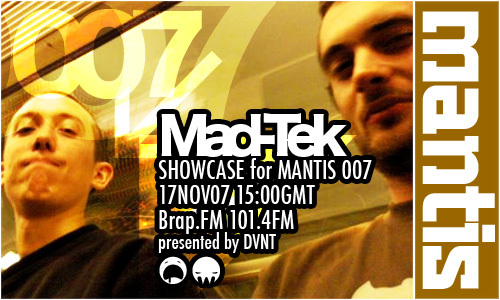 Bristol based Dissident crew Mad-Tek (Gyu & Globe Rotter) turn in a delicious electro breaks tech session for Mantis Radio. Mad-Tek consists of Gyu and Globe Rotter, (Guy and Joby) both part of the Bristol based Dissident crew. They’re not really traditional musicians but they like to perform their music live and get involved in it on stage. In the past this meant carrying the whole studio out on stage but they’ve not been able to resist the move towards the much more portable laptops now. Lately DJing together has become an interest, mixing up breaks, techno, wonky minimal and anything else that fits. 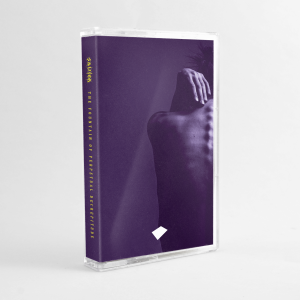 Mantis Radio came across a mixset from these guys back in June and alongside their 4 track EP on Digital Distortions (False Flag EP), they became a fave of DVNT. X and Fix VIP are 2 tunes that still continue to rip the dancefloor apart. Either side of another f*cking superb showcase mix (thanks guys), DVNT went all over, dropping the likes of Ed Chamberlain, Kode9, The Hacker, Dave Clarke, Aaron Spectre and Surgeon, as well as fresh Boxcutter, Milanese, Skeetaz, Lawgiverz and Coki with the anthemic Spongebob. Coming up next month is our last monthly broadcast (we’re going bi-weekly from the new year) we are honoured to have Dr. Schmidt providing a Maschinen Musik label showcase. So tune in for the last Mantis Radio of 2007.